Lady Helen Wrexhall is about to make her debut at the court of Queen Charlotte and officially step into Regency society and the business of marriage. But Helen is about to discover that beyond the glittering ballrooms of Mayfair is a shadowy world of strange powers, missing housemaids and demonic conspiracies. Standing between those two worlds is Lord Carlston, a man of ruined reputation and curt manners. He believes Helen has a destiny beyond the ballroom; a sacred and secret duty. Helen is not so sure, especially when she realises that nothing around her is quite as it seems, including the mysterious Lord Carlston. Set against a backdrop of whispered secrets in St James's Palace, soirees with Lord Byron and morning calls from Beau Brummell, Lady Helen and the Dark Days Club is a delightfully dangerous adventure of self-discovery and the dark choices that must be made ... whatever the cost. A tantalising trilogy set in Regency London from the award-winning author of Eon and Eona. 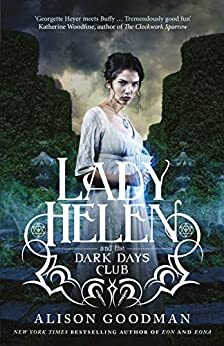 Lady Helen and the Dark Days Club (or just The Dark Days Club for those overseas) is a magical, mysterious snapshot of life in the Regency times as our titular character is exposed to a dark world of demons, alchemy and occultism. From the moment we meet Lady Helen in her Regency world, we are taken on a vivid and exciting adventure. For those who haven’t been exposed to the Regency times, you can expect female oppression, outdoor plumbing, and meat markets disguised as soirees. Major political and social upheaval was going on at the time, and Goodman has done a wonderful job in bringing this too life without taking over the story. I adored this book. The writing was succinct and eloquent. The world building was phenomenal and a lot of research has obviously gone into each fine detail. The characters are alive and engaging. Our heroine, Lady Helen, is wonderful and strong, without being too overt (which I think would have gone against the times). I had hoped that the character of Delia was explored more but I am hopeful that she will appear in book two. Goodman did such a wonderful job of this novel and it is obvious she was very passionate about it. I highly recommend you checking it out. 5.0 out of 5 starsWhat a romp! I'm not a fan of historical novels. But can I say I LOVED this book! It's a page-turner from start to finish with enough historical accuracy to support the fantasy elements of the story. Very well crafted story and extraordinary characters draw the reader in from the start. 5.0 out of 5 starsExciting book. I got this book in the bookbub promotion. It is so good I bought the next one immediately after finishing the first. I like all of the characters except her brother. He is a git. The writing wasn't jarring once. The story was well paced and the questions were answered. New ones popped up though. I have already read the next book and am definitely invested in the series. I am not good at reviews without spoilers, so I won't say anymore. Except it was a good long read. I hate short books. 5.0 out of 5 starsPride and Prejudice meets Buffy! I loved this book. The story had me hooked from the start and I just had to keep reading to see where it would lead. Can't wait to read the next one. A great read including the most well researched Regency details i have seen in a very long time, mixed with original fantasy to create something truly magical. Brilliant! Enthralling mix of history and fancy - it's Downton Abby meets Buffy! 5.0 out of 5 starsCollective Rate: 5 stars!!! Suspenseful and an exceptional novel with all the right elements including demons, secret histories/society, love triangles, balls & dances, historical references as well as clever character dialogues of the Regency period which makes the voices of the characters authentic. These are all interwoven by brilliant storytelling with considerable historical research. Lady Helen was a pleasure to read and unputdownable. The author’s feminist voice and perspective also shines through at obvious parts, with stereotyped male characters such as Helen’s uncle and Benchley. The plot keeps you constantly guessing what Helen is and what choice will she make next?! A great read. A very well deserved 5 stars for this one!!! I had the privilege of receiving this as an ARC which followed with the pleasure of doing a read along when members of my Read3r’z Re-Vu.. A lot of research and thought had gone into writing this book, setting is historically accurate and after very careful world building in the beginning, this epic tale was simply “unputdownable” twists, turns – you develop your own theories only to be shutdown in the next chapter.. There were times when my feminist streak would take over and I want to talk to some of the misogynist characters with my fist!!! Parts best read during daylight hours.. I am really looking forward to the next instalment.. great read! !